Little visited and largely unknown, the Bisti Badlands is an amazingly scenic and colorful expanse of undulating mounds and unusual eroded rocks covering 4,000 acres, hidden away in the high desert of the San Juan Basin that covers the distant northwest corner of New Mexico, yet this area is just one of many similar regions in the region, the remainder even less publicized. 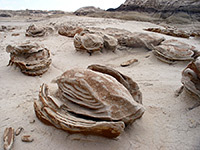 The badlands are administered by the BLM (Bureau of Land Management), are free to enter, and are known officially, but less evocatively as the Bisti Wilderness Area. 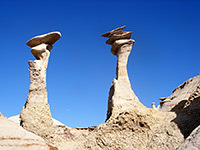 There are no signposts pointing the way to Bisti from any nearby towns, but the usual approach route is along NM 371 from Farmington, the largest town in the Four Corners region - this heads due south through wide open prairie land at the east edge of the great Navajo Indian Reservation, which extends for 200 miles across into Arizona. 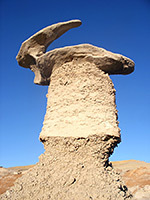 After 36 miles, a historical marker records the history of this area and of the nearby Bisti Trading Post, now derelict, while the main entrance to the badlands is 6.5 miles further south. 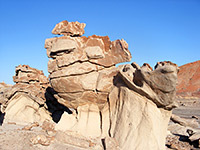 Bisti is the smaller component of a 15 mile wide wilderness area that also includes much larger De-Na-Zin Wilderness which is equally colorful and even more remote, although partially covered with vegetation. There are two principal access points for the Bisti Wilderness Area (see map), both just a short drive from NM 371. The official (signposted) approach is from the south, along country road 7297, a good quality gravel track which leaves the highway between mileposts 70 & 71 and meets road 7000 after 2 miles across flat grasslands. Turning left, this track soon reaches the edge of the badlands and descends into a wide shallow valley, where the featureless plain is replaced quite abruptly by a multi-colored eroded landscape of small clayish hills, shallow ravines, and strange rock formations stretching for many miles, and colored a vivid mixture of red, grey, orange and brown. The road passes a parking/camping area on the right, with a BLM trail register and notice board, then crosses a dry wash and climbs a little through an group of red and black mounds. There is a second parking area also on the right, just before the hills, then although the road continues northwards, it is closed by a fence not far beyond. Parking and camping are possible anywhere along the road before this point, however. The northern approach is via a less-used track (county road 7293), forking off NM 371 just south of milepost 73 and joining road 7000 near the remains of a settlement associated with the old Bisti Trading Post. The closest parking area is a short distance northeast, on mud flats beside the fence marking the wilderness boundary. The loneliness of this strange and deserted land is emphasized by the ruins, which include a large warehouse, several storage sheds, other concrete foundations and most poignantly, a childrens' playground, now overgrown and rusty. There used to be a sparsely furnished church but this was destroyed by fire in 2002, following a wind storm that also damaged some of the other buildings. Walking around this sandy, wind-swept location, which now has the appearance of being deserted for many years, is a moving experience, made all the more so by the mysterious landscape opposite. 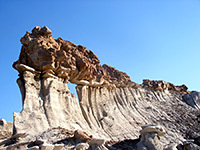 Hiking routes through the badlands - north, south and west areas. which also harbor occasional caves and narrow fissures several meters deep. 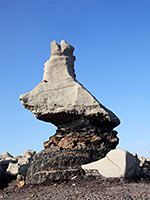 Much of the surface is unstable - the layers are often loose, rocks are crumbling and some of the formations are quite delicate, so hikers should take care not to damage the features; there are no established trails, but walking along the ravines and the valley floor is the usual way to explore. Petrified wood is scattered across the surface, especially to the southeast - sometimes entire tree stumps, with the bark and growth rings still clearly recognizable. Fossils may also be found, and the teeth and bones of a variety of large dinosaur species have been discovered embedded in the earthy layers. Navigation can be difficult, as there are no major landmarks in the badlands, and little change in elevation, though there are several groups of distinctive orange-colored mounds in amongst the generally yellow-brown hills, that do help when route-finding. The hills also contain black coal layers, in between the shales and sandstones, and also complex bands of red/purple/black metamorphosed rock, formed by ancient coal fires. These rocks are found as boulders and strata embedded in the lighter layers, and also as fine pebbles, scattered over the surface. There is little sign of wildlife in the badlands, and vegetation is limited to small bushes along the bigger washes - otherwise the land is completely bare. The nearest large towns with hotels close to the Bisti Badlands are Bloomfield (48 miles), Farmington (35 miles) and Grants (102 miles).